Manchester City full-back Benjamin Mendy will be not be included in Pep Guardiola’s squad for the trip to Wales on Saturday. The Frenchman has featured in four of City’s five Premier League matches at the start of the 2018-19 campaign and has impressed with his willingness to get forward and strength in defensive positions. The 24-year-old missed the majority of the team’s title-winning season last-term with a serious knee injury, but he has returned in a determined mood over the last month, having been part of France’s World Cup-winning squad over the summer. However, Mendy was hit with another setback last week, sustaining a metatarsal injury in training, which ultimately ruled him out of City’s Champions League group stage tie against Lyon on Wednesday. According to the Manchester Evening News, Guardiola has given a blunt update on the defender’s fitness in today’s press conference, stating that he remains ‘injured’. This news will come as a blow to supporters who had been hopeful of seeing the French stalwart back in action, particularly given the team’s troubles defensively against Lyon during their 2-1 defeat. Fabian Delph was drafted in as his replacement but he struggled to cope with the Ligue 1 side’s talented attacking players and was at fault for Maxwel Cornet’s opening goal. The Citizen’s must now focus on their next Premier League game without Mendy, against Neil Warnock’s Cardiff on Saturday, which will be a tricky away fixture for the English champions. 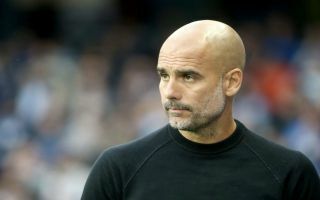 Guardiola’s men will be expected to win but they cannot afford to show the same level of defensive naivety against the Bluebirds, with Liverpool and Chelsea currently setting the pace ahead of them in the league table.